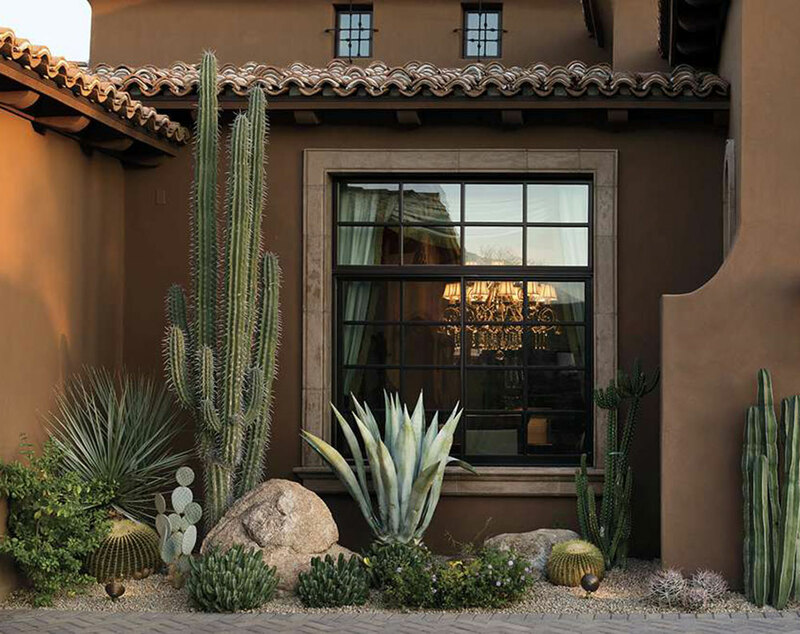 Melodie and Stephen Lynn wanted a quintessential desert landscape for their home, which includes a front yard filled with towering cacti, including an organ pipe and saguaro. According to lore, the ancestors of the Tohono O’odham people collected fruit from the very first saguaro to make wine for a rain prayer ceremony. But consumption of the fermented drink led to fighting. The elders were quick to banish the fruit, assigning a badger with the solemn task of taking the remaining seeds to be disposed in the sea. But, the dutiful badger became duped by that most wily of desert dwellers, the coyote, who upended the cache of seeds, scattering them to the winds to take root where they may. Today, of course, the saguaro—the largest cactus in the United States—is the most iconic living symbol of the Sonoran Desert. 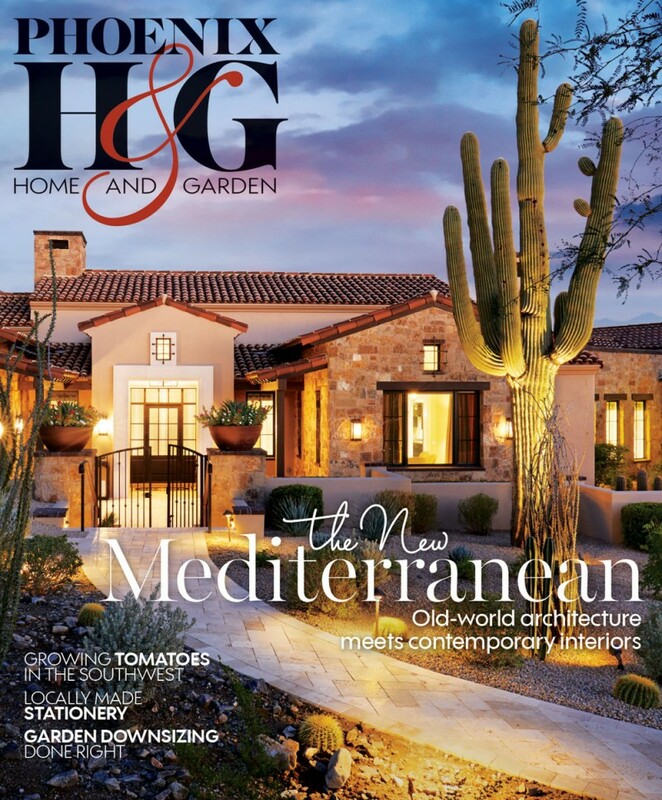 For this reason, the towering, columnar plant was at the top of a “must- have” list for Melodie and Stephen Lynn, when they decided to renovate the landscape of their 5,400-square-foot home situated near the seventh hole in the Scottsdale golf community of Mirabel. “When you don’t live in Arizona, and you think of a cactus, the picture in your mind of what it looks like is that of a saguaro,” say Melodie. 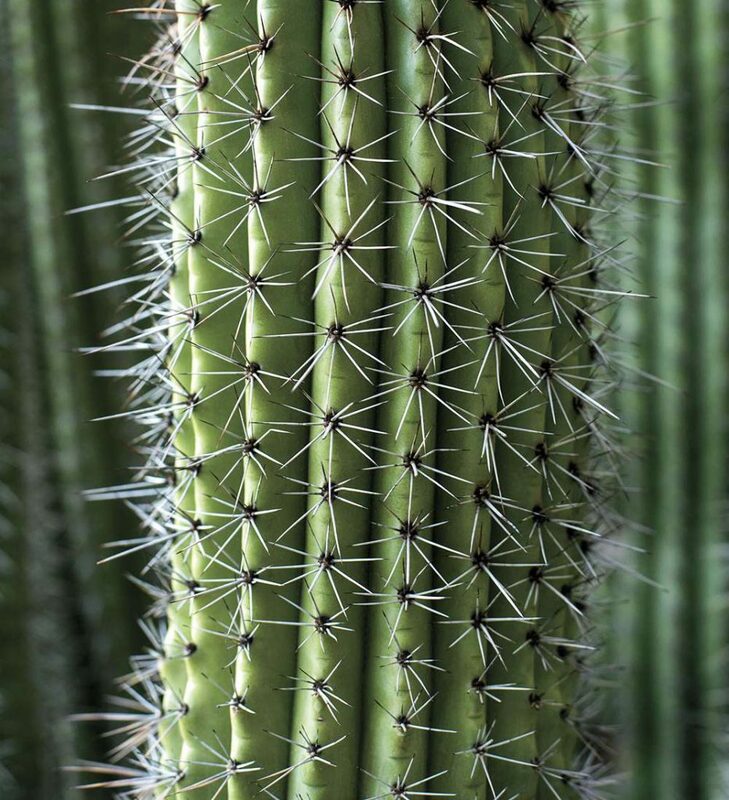 Clusters of sharp spines run along the ribs of an organ pipe cactus. The recent transplants wanted to emphasize native flora on the sprawling, nearly 2-acre property. “Having lived in Texas for more than 30 years, we really wanted a lot of different species of cacti and succulents that would pay tribute to the natural beauty of the desert that we’ve come to love,” she adds. Not long after settling into their new digs, the couple started exploring options for an entire landscape renovation. 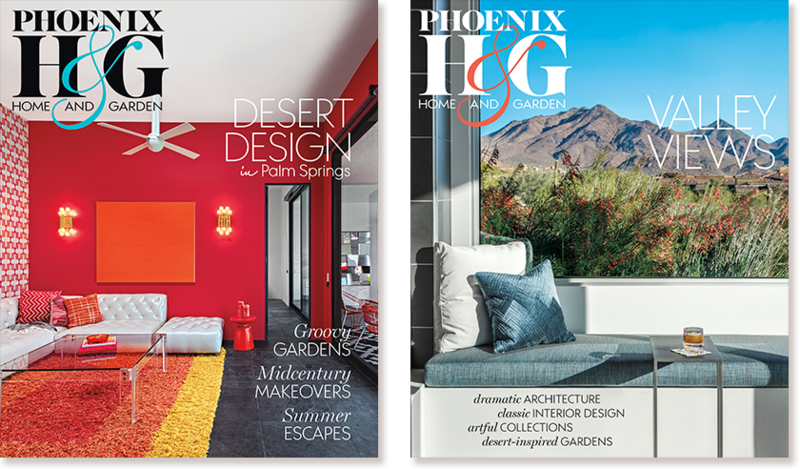 They were more than impressed by the portfolio of landscape designer and Phoenix Home & Garden Masters of the Southwest award winner Chad Norris, whose work can be seen in yards throughout numerous North Scottsdale communities, including Mirabel. Framing the dining room window at the front of the house are a tall candelabro cactus (Pachycereus weberi), blue agave and Royle's spurge (Euphorbia royleana). 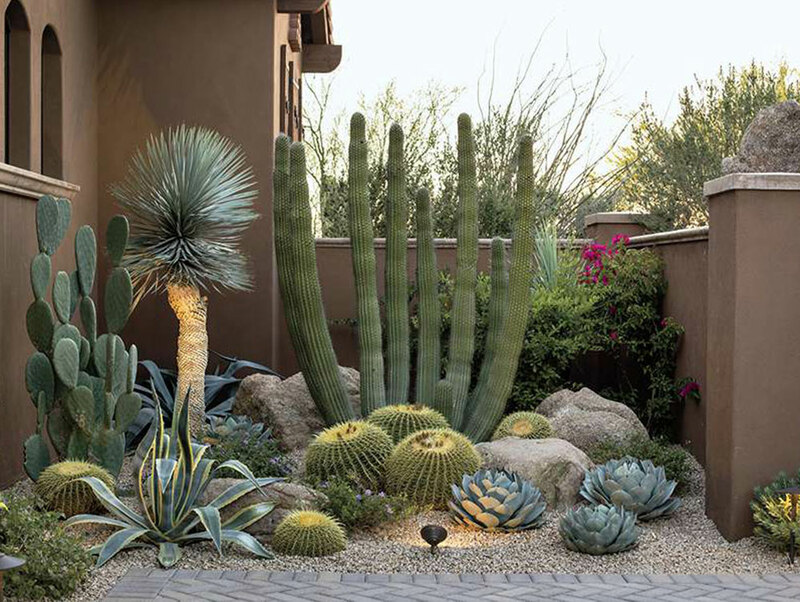 A blue yucca, purple prickly pear, Moroccan mound, golden barrels and fishhook barrels (Ferocactus wislizenii) round out the setting. Norris began by clearing the property and salvaging many of the existing and neglected cacti, which his team restored to health. He also oversaw work on foundational elements, building contours that would introduce dimension to the property and present distinct focal points. “Contouring the terrain can really help emphasize view corridors—areas that draw the eye through the landscape—and create a more dramatic canvas. An agave, for example, makes a bigger statement when it is planted on a slope rather than on flat ground,” Norris explains. 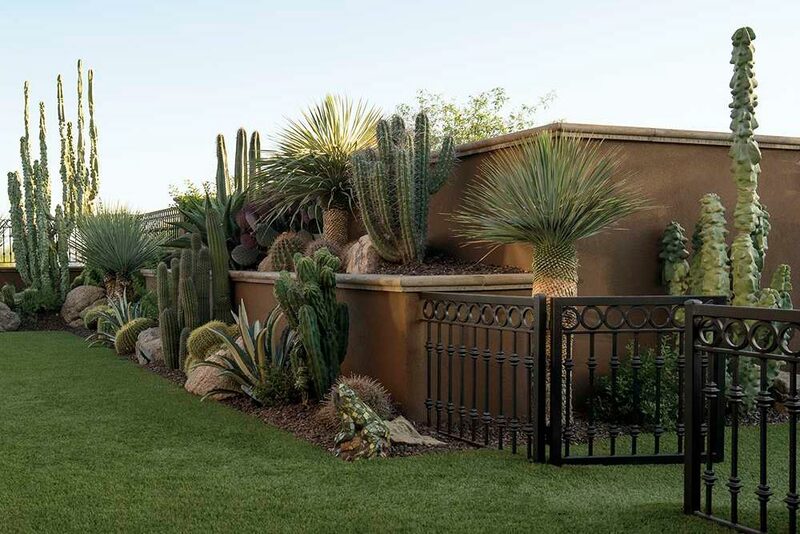 The designer and his crew also added between 40 and 50 tons of boulders to help anchor key plants and create a seamless transition from the property to the surrounding desert. 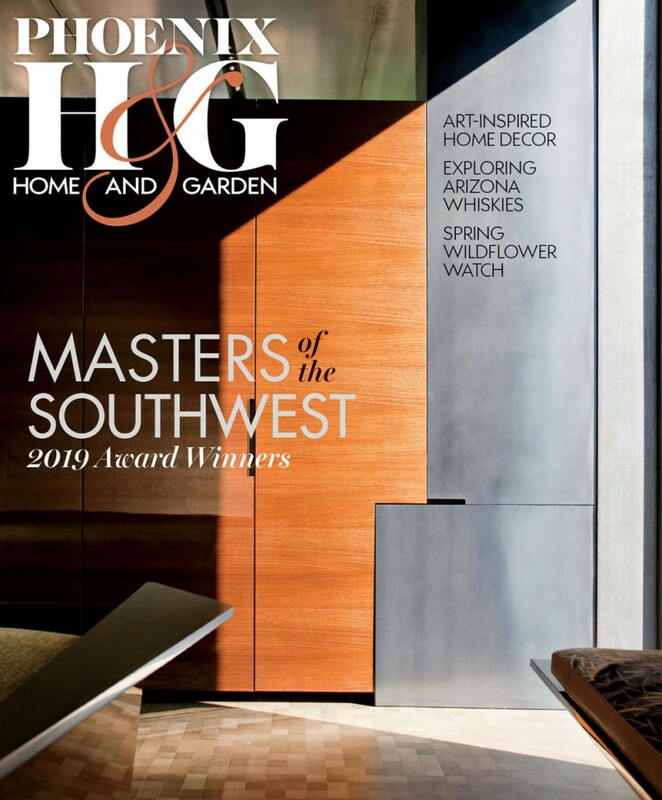 For greenery, the homeowners selected dozens of cactus and succulent species, from the signature saguaro, organ pipe cacti and crested myrtillo cacti; to purple, native and Indian fig prickly pear; to golden barrels, pin cushions and yuccas; and a variety of agave species. As a result, the landscape is now a stunning showcase of desert botany. “We haven’t counted, but we believe there are at least 35 to 40 different varieties of cacti surrounding our house,” says Melodie. 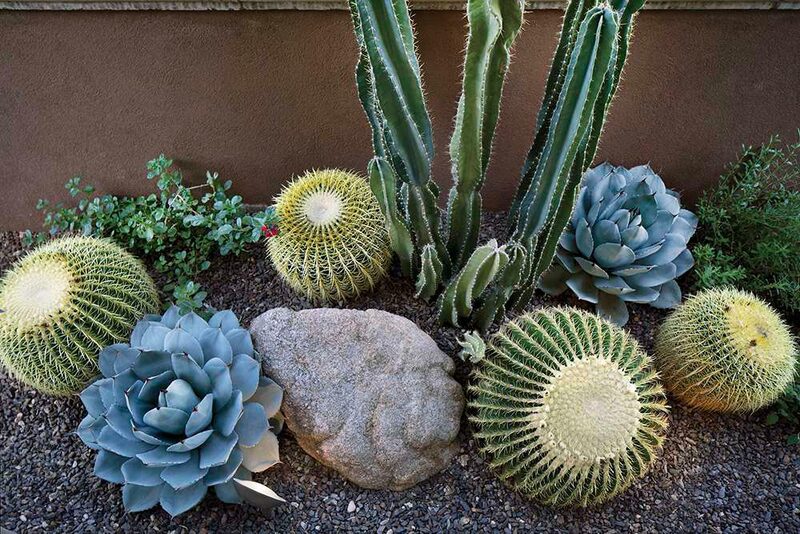 Norris adds that the combination of cacti and succulents ensures lots of color and texture, year-round. 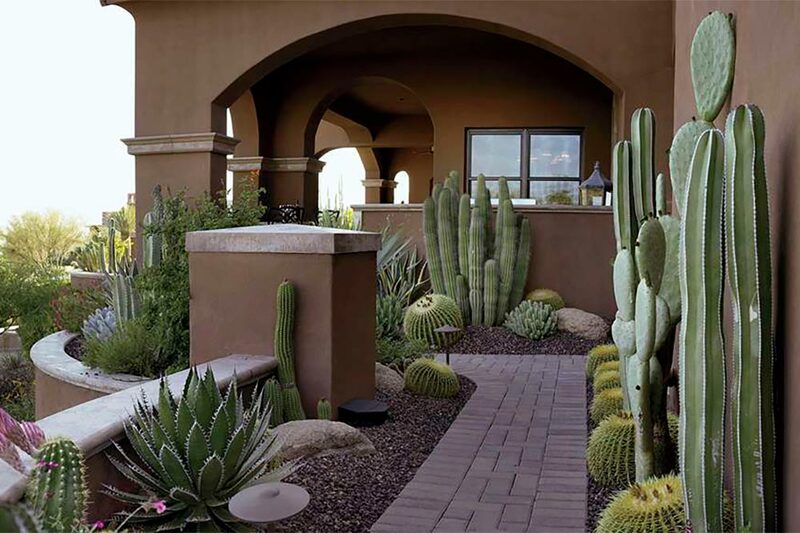 Throughout the property, he created eye-catching plant vignettes for visual interest from every angle, from clusters of golden barrels combined with soft purple lantana ground cover to groupings of cacti planted atop mounds. “We wanted a lot of these so that no matter where you turned or no matter which window you looked out, there was one heck of a view,” says Stephen. The aesthetic diversity was further enhanced with the placement of larger columnar specimens, such as saguaros and organ pipe cacti, which add vertical appeal. 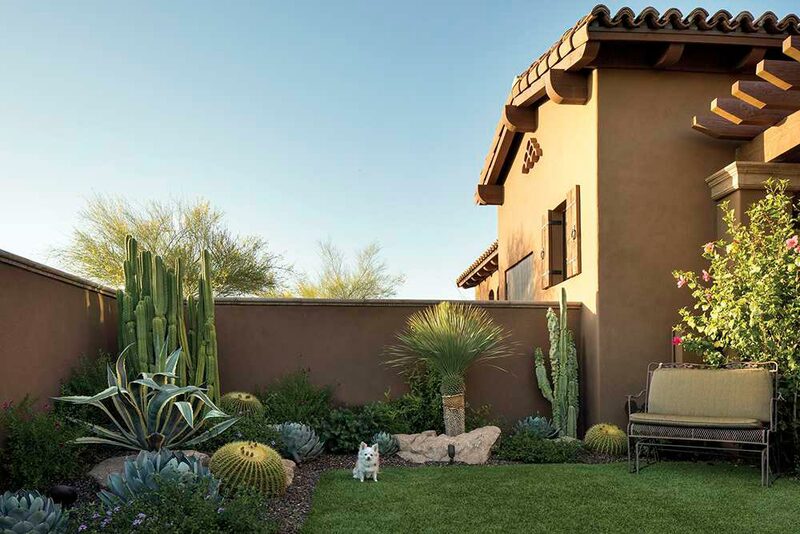 A side yard features faux turf and a gated play area for the couple’s three long-haired Chihuahuas. 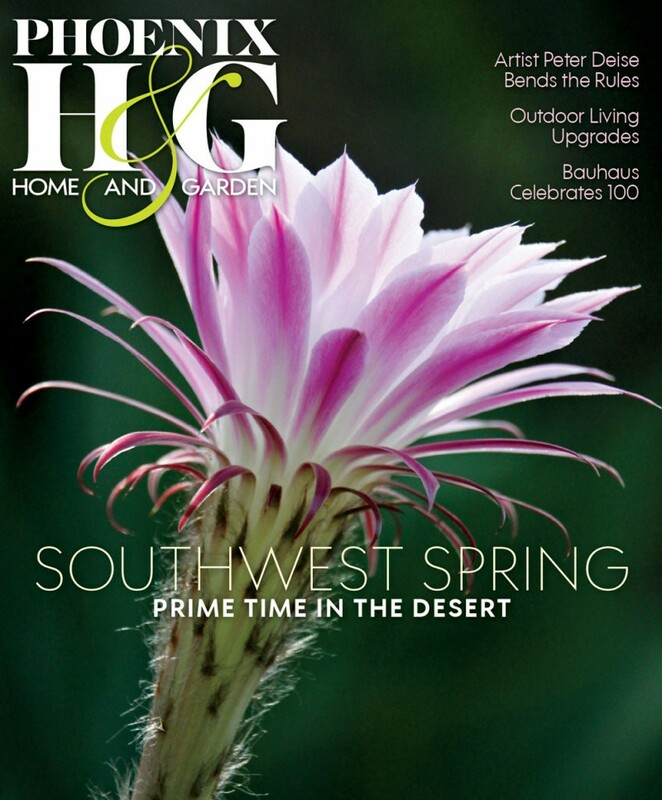 Plant beds surround the area, bursting with cacti, boulders and colorful blooms. “No two areas look the same,” says Melodie. 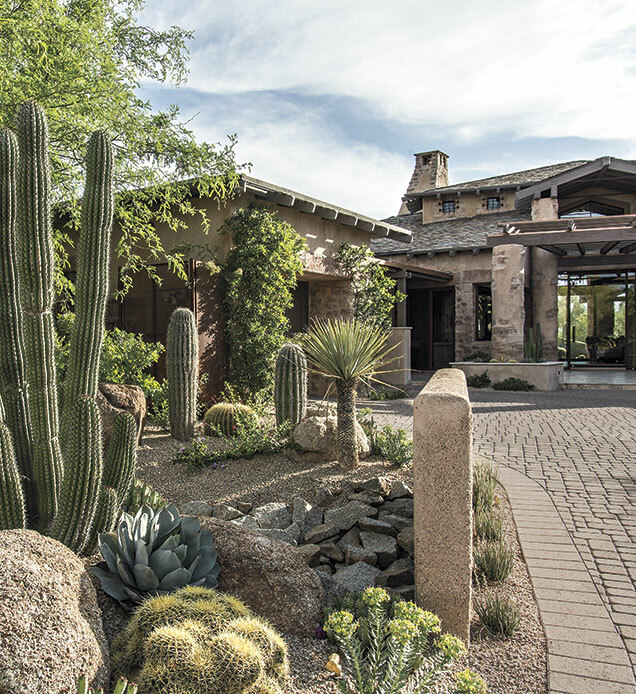 Cumulatively, perhaps the most impressive effect of the landscape renovation is that it concentrates the beauty of the desert in gradual stages that almost overlap into the Lynns’ house. In fact, with a set of large sliding-glass doors that open from the family room to the backyard, “there is an almost invisible flow from inside to outside—and the landscape in our back just seems to be almost like an extension of the family room,” says Melodie. 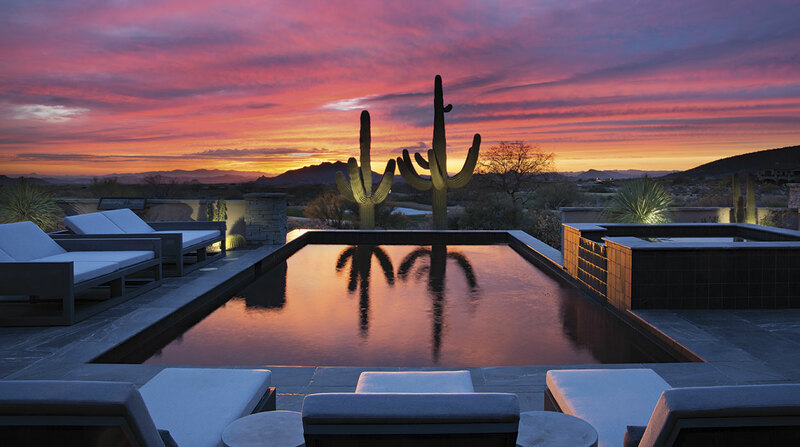 Understandably, the Lynns are excited to enjoy spring in the comfort of their newly landscaped Sonoran Desert sanctuary, surrounded by the saguaro-studded scenery that lured them to the Valley in the first place. Nestled between boulders, an organ pipe cactus holds court in a small corner of the front yard. It is surrounded by Indian fig prickly pear (Opuntia ficus-indica), blue yucca, golden barrels and artichoke agaves. 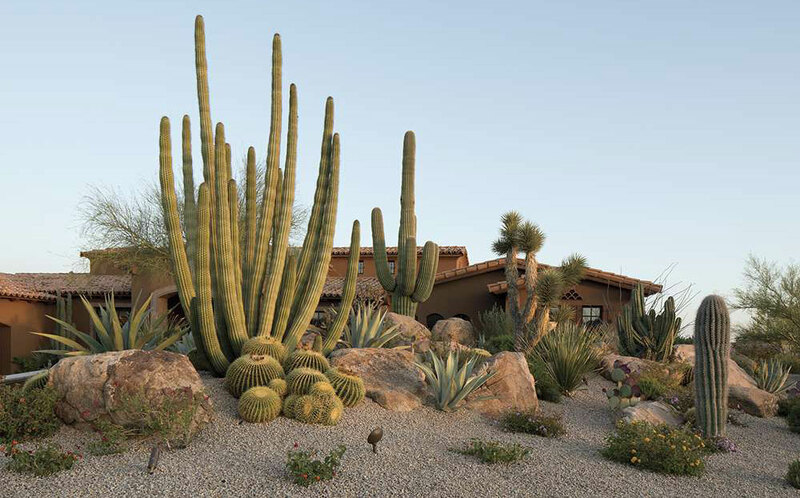 A massive saguaro—a must-have for the homeowners—is a focal point of the front yard. Nearby, a multi-armed organ pipe is fronted by a cluster of golden barrels. 1. A pathway leading around the house is lined with lush groupings of cacti in shades of green and yellow. 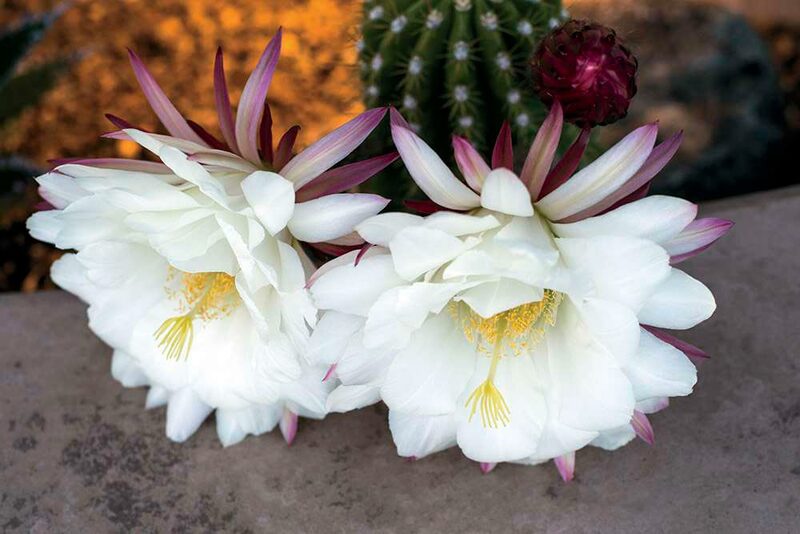 Some of the many species included are Argentine giant (Echinopsis candicans), Mexican fence post, organ pipe and golden barrels. 2. The night-blooming flowers of an Argentine giant. 3. On the side of the home, an enclosed area with artificial turf allows the Lynn’s three long-haired Chihuahuas to enjoy the outdoors without threat from predators, such as coyotes. A San Pedro cactus (Echinopsis pachanoi) in the corner, along with a large century plant, shaved yucca and totem pole cactus help camouflage the stucco wall. 4. 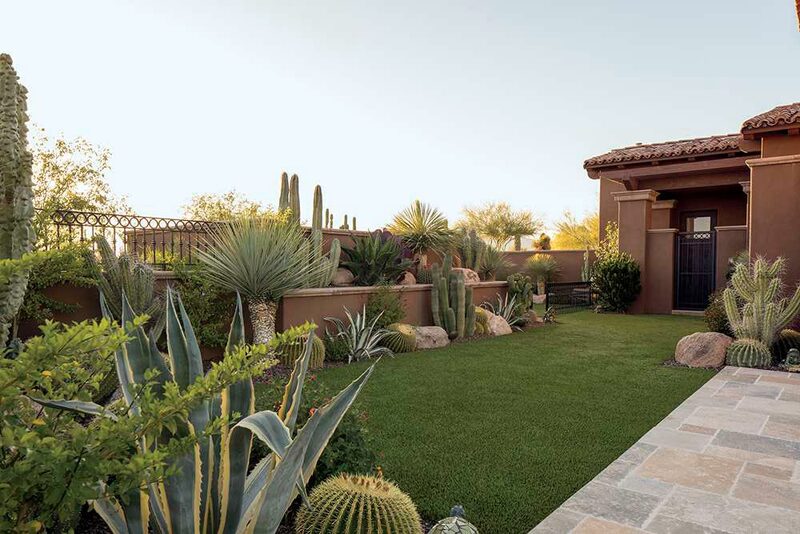 “We wanted our landscaping to accentuate the fact that we live in a golf community with mountain views from every angle and to provide a Zen-like environment,” says Melodie. 5. 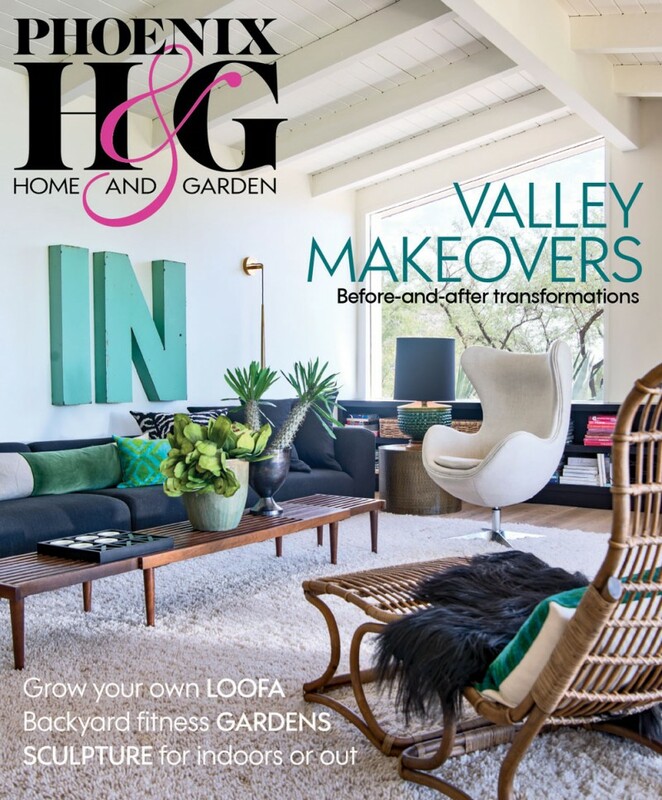 The drought-tolerant, low-maintenance landscaping boasts “very dense assemblages that look like they’ve been there forever,” according to landscape designer Chad Norris. 6. A grouping of artichoke agaves and golden barrels underline the wide spectrum of colors available in cacti and succulents. 7. Raised beds add extra layers of texture and height to the backyard. 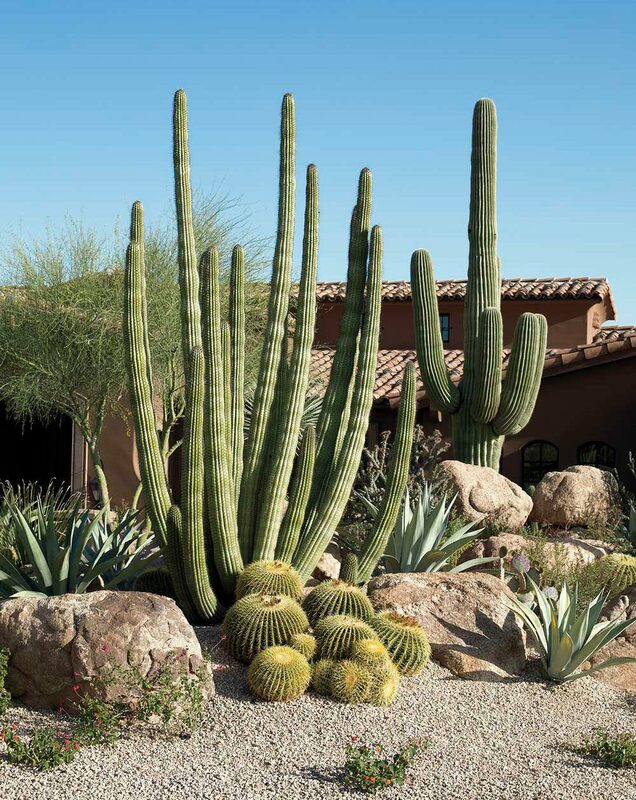 Columnar cacti, including totem pole, organ pipe, senita (Pachycereus schottii) and Argentine toothpick (Stetsonia coryne), complement the spiky and circular forms of shaved yucca, century plants and golden barrels. The iron gate opens to the dogs’ play area. For more information see Sources.